KATHMANDU (24 June 2018) – Prime Minister KP Sharma Oli has returned home today after completing a 6-day official visit to China. In a press meet organized at Tribhuvan International Airport upon his arrival, PM Oli shared the achievements of the visit that both sides agreed to forward the cooperation on railway, roadway, port, air route, and communications under the framework of Trans-Himalayan Multi-Dimensional Connectivity Network, so as to accelerate the implementation of the agreements under Belt and Road Initiative. Expressing confidence that China would extend utmost support to Nepal in its national campaign of ‘Prosperous Nepal, Happy Nepali’ along with political stability, social harmony and economic development, PM Oli said both Nepal and China agreed to effectively implement the agreements and MoUs, including those signed during his 2016 visit. “The 14-point joint statement was issued after extensive preparation and rigorous discussion between Nepal and China,” he argued, adding that the visit would help augment the ambit of economic assistance to Nepal. According to him, the agreement on railway connectivity was one of the milestones. With its implementation, feasibility study on development of railway connecting Keyrong to Kathmandu via Rasuwagadhi with Chinese grants would be conducted soon. It also prepares base for construction of Kathmandu-Pokhara-Lumbini railway, he added in a press note distributed to the media persons. “It is a historic agreement in the history of two-country relation,” he underscored. Agreements were made to expand air connectivity, upgrade infrastructures for land route, and north-south transport. For this, additional study would be made on development of Koshi economic corridor, Gandaki corridor and Karnali economic corridor. The airline companies in the both countries would be encouraged to work for operating direct flight. Feasibility study would be conducted on Keyrong-Rasuwagadhi-Galchhi-Ratmate 400 KV transmission line as per the MoU held between Nepal Electricity Authority and Chinese State Grid Corporation. Moreover, the press note mentioned that for the immediate implementation of the agreement on Nepal-China transit, discussion on necessary protocol would be held in July. Tatopani border will be reopened by May 2019, while Rasuwagadhi-Keyrong border point would be upgraded. The Chinese side has agreed to conduct feasibility study of oil and gas and assist in creating necessary infrastructures for storing petroleum products. Both countries have agreed to open the additional borders as per the agreement. China has also agreed to provide economic and technological assistance under the post harvest technology for the production of agricultural goods. China has taken it positively to set up Nepal’s General Consulate in Chengdu and help boost tourism in view of Nepal’s announcement to mark 2020 as Visit Nepal Year. According to the PM, the Chinese side positively responded to the Nepal’s proposal for increasing Chinese government scholarship quotas for Nepali students and seats for other training opportunities. Both countries have agreed to further expanding and strengthening bilateral ties through the exchanges of high-level visits. Chinese President invited to visit Nepal. 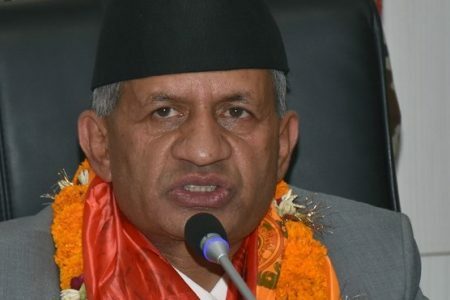 Informing the media about his visit, he said he, on behalf of the President, extended an invitation for Nepal visit to the President of China, and himself invited his Chinese counterpart for the visit, expressing confidence that high level visits from the northern neighbour will take place in Nepal in near future. Line wise, during his stay in China, he held interactions with the Nepali community thereby visiting the Beijing-based Nepali Embassy and Lhasa-based Consulate General and addressed the China-Nepal Business Forum in Beijing jointly organised by the Nepali Embassy and China Council for the Promotion of International Trade (CCPIT). He also inaugurated the Nepal-China Friendship Run Programme in the Beijing Sports School. The programme aims to promote Nepal’s tourism in China. Likewise, as he said, his meeting with the chair of Asian Infrastructure Investment Bank held in Beijing was focused on increasing Bank’s investigation on Nepal’s energy generation and infrastructure development sectors. Similarly, discussions were held focusing on the Nepal-Tibet trade, tourism and investment aspects and on the systematic operation of Nepal-Tibet borders during his meeting with the chair of the Tibet’s people’s government. MOU on Energy Cooperation; Agreements on the Reconstruction of Friendship Bridge and Resuo (Rasuwa) Bridge; Agreement on Transit Transport , Memorandum of Understanding (MOU) on Investment and Cooperation on Production Capacity; the MOU on the Establishment of Mechanism for Facilitation on the Implementation of China-Nepal Cooperation Programmes and Projects in Nepal between the two Foreign Ministries MOU on Strengthening Cooperation between the two Foreign Ministries and MOU on Human Resource Development Cooperation are the achievement of the visit. Similarly, the exchange of letters regarding the reconstruction of the Nuwakot Palace, rebuilding of schools in Rasuwa, Dolakha and Sindhupalchowk district and the MOU relating to the nine river control projects in nine rivers in Jhapa district under the Eastern Tarai River Control Project remained as the visit outcomes. As he said, under his witness, Nepal and China’s public and sector business communities signed nine agreements relating to hydropower and production, expecting that such agreements would help to bring in huge investment from China in the country. The high-level visits to Chinese leaders and discussions made during the visit to China have promoted to mutual trust and understanding resulting in robust political relations, the PM said. Likewise, discussions and agreements on railway, energy, transit, physical infrastructure, investment and tourism have widened the area of cooperation, adding that that have prepared the format for long-term economic assistance, the PM observed. 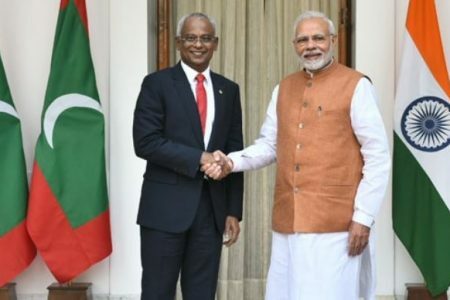 Similarly, the PM has also termed the MoU on railway connectivity as a vital document between the two countries, adding that this has paved away for trans-border connectivity in the days to come. Furthermore, PM Oli said that interactions among the intellectual and business communities between the two countries have prepared a foundation to further cement the bilateral relations. “So, I am confident that my visit turned more fruitful than my objective that I shared with the media before leaving for China,” the PM added. PM Oli was of the opinion that the government was moving ahead with the policy and plan of actions to fully mobilize internal and external resources for the rapid economic development by promoting country’s sovereignty, independence, geographical territory, national interests and pride. 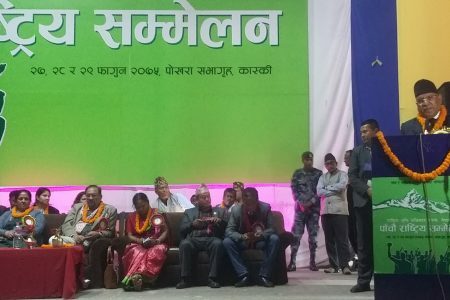 “I visited the neighbouring countries in order to solicit the goodwill and support from the neigbhours and ensure partnership with them,” PM Oli said. Oli said that now our focus should concentrate on effective implementation of the agreements signed with the neighbours for our prosperity. PM Oli, on the occasion, thanked the Chinese President, Chinese Premier, all state bodies of China, leaders and officials of the Tibet Government and the entire Chinese nationals for their warm welcome to the Nepali delegation during the six-day official visit.